Fresh or frozen cherries brighten this cherry quick bread which is made in less than an hour from start to finish. 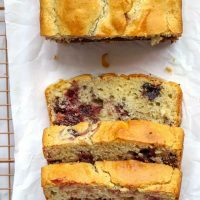 Bake with gluten free or traditional flour to make this easy cherry bread: both results are a special treat! Simply the thought of a bowl of cherries can brighten your day. Yup, you are smiling already just thinking of a food memory with cherries as the star. Bright red and juicy, cherries are a happy food for sure. Quick bread are breads that are made with leaveners other than yeast (or sometimes eggs). Baking soda or baking powder are the ingredients that create the leavening or volume in this type of baking. The quick bread needs no time to rise in the way a yeast bread would. It must be baked quickly (hence, its name!). You are likely very familiar with some quick breads like banana bread, corn bread, scones, and most muffins. 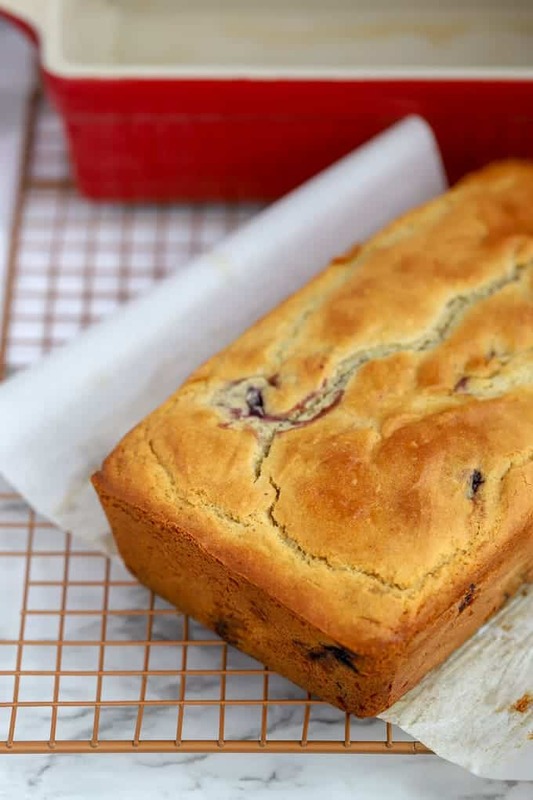 This cherry version of quick bread is a wonderful way to incorporate fruits into your baking. Looking for more quick bread recipes? Try this strawberry bread , raspberry bread or this upside down banana bread. Or if you have a bit more time and want to develop a yeast bread, try gluten free cinnamon rolls, whole wheat pita bread, or heirloom tomato focaccia. 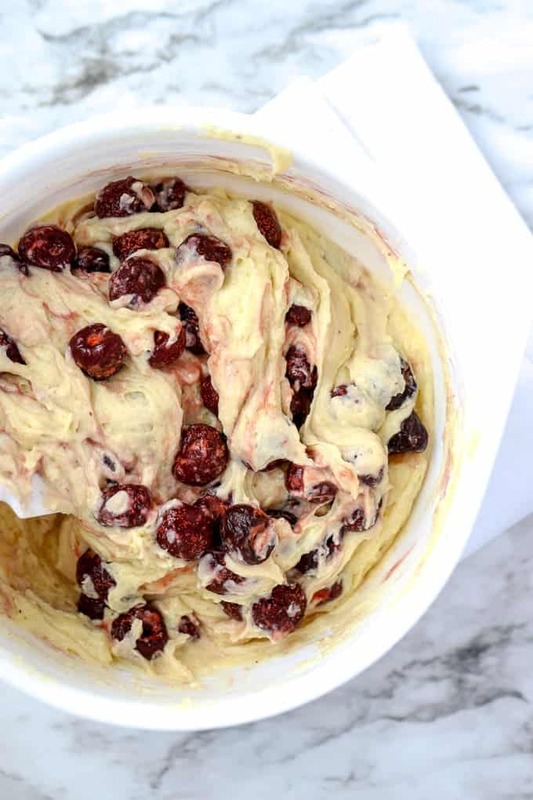 Can I bake with frozen berries? Fresh cherries are a beautiful ingredient. Unfortunately they aren’t available fresh year round. You can easily bake with frozen berries in this quick bread. The package of frozen cherries that I used stated that it was recommended to bake directly from frozen. Feel free to do just that. I found success letting the cherries thaw for ten to fifteen minutes. Place them in a strainer over a bowl. You could even add the extra cherry juice back into the batter for more cherry flavor. Looking for cherry recipes? You’ll enjoy these: Cherry Clafouti, No Bake Cheesecake Bites, and Ginger Cherry Cheesecake Squares. OK, no big surprise here but quick breads are not meant to take very long to make. The ingredients come together quickly. Combine the two and bake immediately. Prepare the pan with parchment and baking spray. 2. 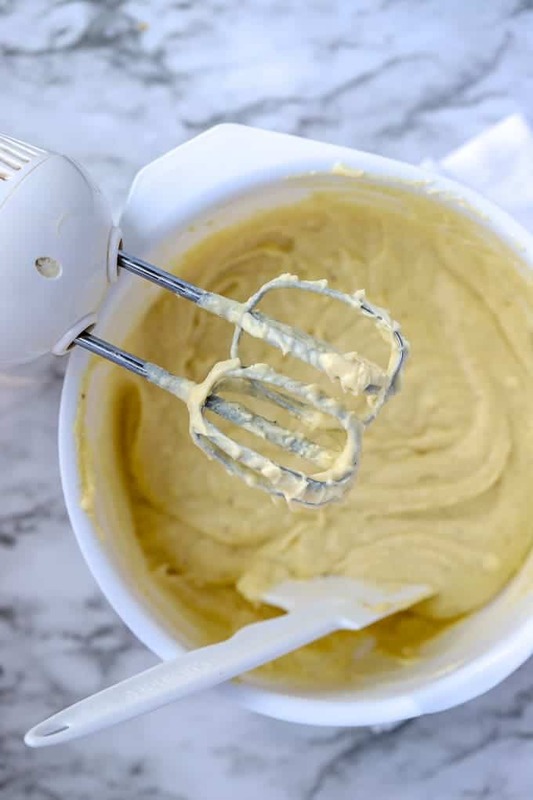 Whisk the dry ingredients of flour (gluten free or traditional), baking powder, salt and nutmeg. You can use other spices such as cardamom if you wish. 4. Prepare the wet ingredients of butter and sugar, then eggs, vanilla and milk. 5. Fold the cherries into the batter. 6. Then pour the batter into the prepared pan and bake. 7. Bake until the top is a light golden brown. Let the gluten free cherry quick bread cool on a wire rack before slicing. Quick breads are nice because they are the fast-food of the bread world. A short ingredient list and about an hour from start to finish in your kitchen is the promise of most quick breads. 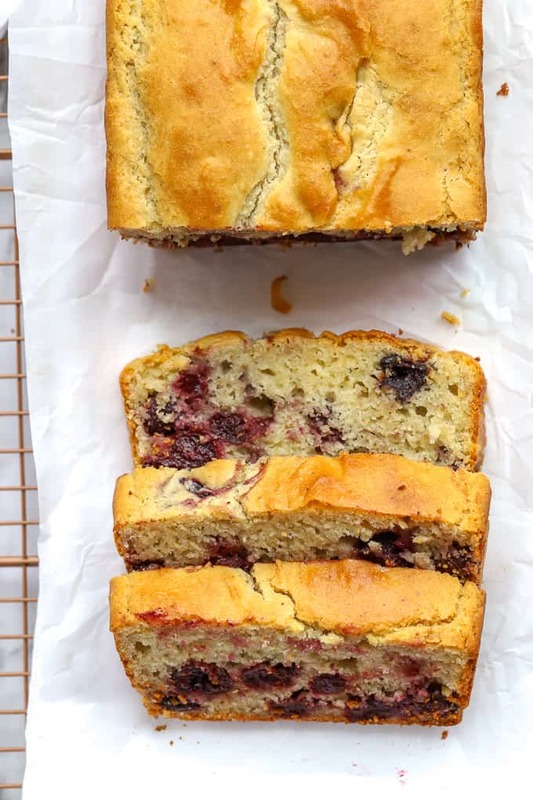 This recipe for cherry quick bread hovers between a bread that could easily be a breakfast treat or a sweet bite perfect with a cup of tea. All day long you will enjoy this cherry quick bread. The recipe is adapted from King Arthur website. A recipe for gluten free Cherry Quick Bread or traditional cherry quick bread can be made in a loaf pan or in muffins tins. Baking with frozen cherries makes this an easy recipe for any time of year. 2 cups 1 to 1 Gluten Free Baking Flour plus 1 tablespoon, separated. Preheat the oven to 350 degrees F. Prepare a 9 inch loaf pan with parchment and baking spray. 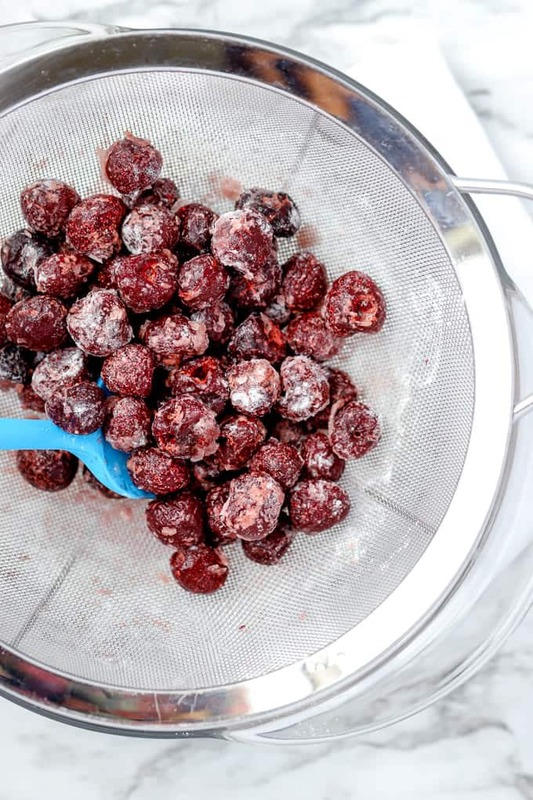 If using frozen cherries, let them thaw in a strainer for ten minutes. Toss with one tablespoon of gluten free flour. Set aside. 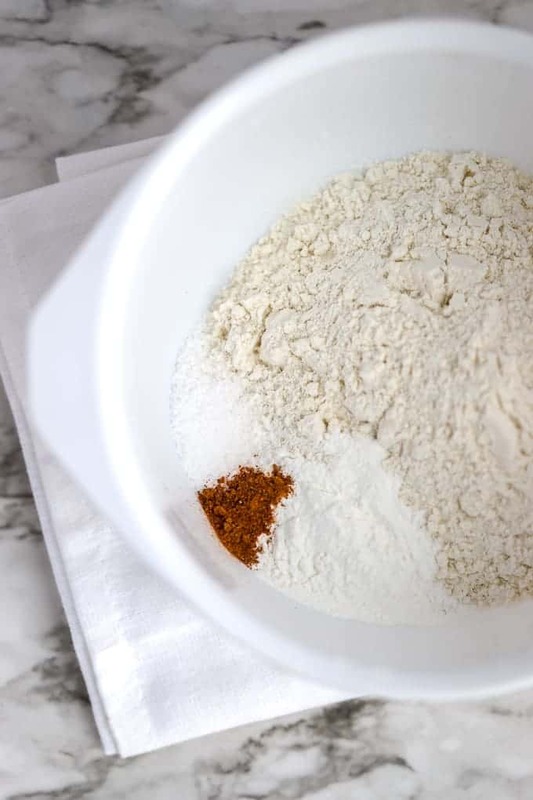 Mix the dry ingredients of gluten free flour, salt, baking powder and nutmeg. Set aside. Beat the sugar and the butter until fluffy. Add the eggs one at a time. Add the vanilla and the milk. 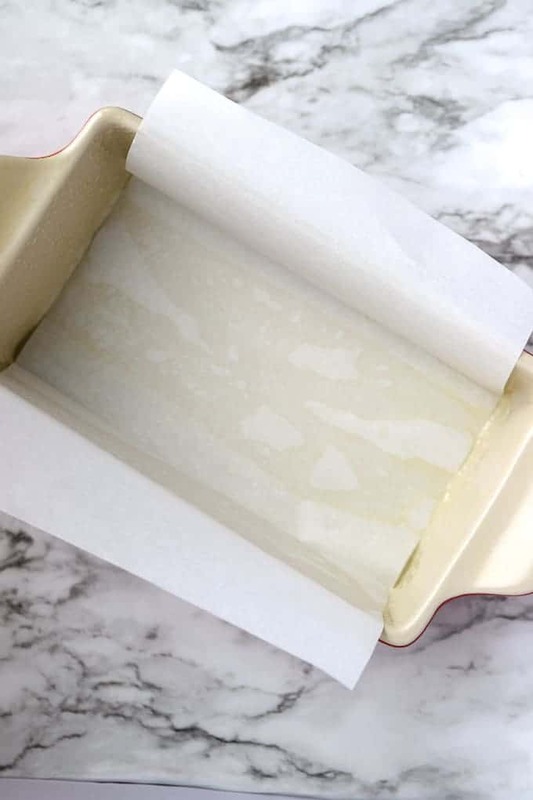 Gently fold the wet and dry ingredients together. Fold the cherries into the batter. Do not overmix. Should you require a gluten free quick bread, please ensure that all ingredients are gluten free. If you are looking for a traditional recipe, please use 2 cups all purpose flour in place of the Gluten Free Flour. Tossing the cherries with flour helps them not to sink to the bottom. The weight of whole cherries makes it likely that they will sink to the bottom. That is ok, the quick bread is still just right. Cutting the cherries in half or in quarters and then tossing in flour will give them a chance to be better dispersed. Are you on Pinterest? Join me and save this Pin on your bread boards! I originally shared this post with the Twelve Loaves baking group. You may enjoy the recipes shared by the group which are listed below. #TwelveLoaves is baking with CHERRIES in June so please join us with your muffins, quick breads, rolls, sweet bread treats and more. I had some frozen cherries ready for this baking challenge and went in the direction of a quick bread. Oh the #TwelveLoaves group has been busy this month! Here is a fantastic assortment of cherry breads to inspire you! #TwelveLoaves runs smoothly with the help of our friends. Thanks to the wonderful Renee Dobbs from Magnolia Days and Liz Berg from That Skinny Chick Can Bake for their help this month! This post was originally published in March 2014 and was updated November 2018. I would have to cut down the cardamom too. I enjoy it a lot but my husband thinks it tastes like mint if there is too much. So it would have to be a subtle addition so he would enjoy the bread. Oh mint is an interesting flavor to think of when having cardamom– I’ll have to really pay attention next time to see if I can catch that flavor profile too. I’ll experiment and let you know. What a lovely bread, and the colour of those cherries! Thanks so much! Cherries really made this a special quick bread, although it would be nice with blueberries or raspberries too. I always forget about using cardamom…I think a small dose sounds lovely with cherries! Beautiful loaf! I’ll have to experiment with cardamom. i often use it in cookies but not in bread. Thanks, Liz! I love how many cherries are studding this bread! I love cardamom, but don’t remember ever pairing it with cherries, I will have to give it a try. Yes, I may have gone a bit overboard with the amount of cherries but just love getting one in most every bite! That is a beautiful loaf of bread that you have baked. I love cherries. They add so much color to the recipe. Thanks for sharing. Yes, cherries really brighten most any recipe. Can’t wait to try some more baking with cherries soon! Cherries are my favorite, this is going to be a great month!! Yes, a great month for baking with cherries! You are right. Cherries just make me smile. Wild cherries, sour cherries, sweet cherries, they all conjure up really fond childhood memories. Always my favorite flavor of anything. You know I would love this bread. I’ll have to try this quick bread with some of the types of cherries you mention. So many possibilities! My favorite lunch or lunch side is quick bread. I don’t usually get creative with cherries but this bread is inspiring me. Thank you for baking this for us! You know, Dionne, I don’t often bake with cherries either but now I will! This month offered so many beautiful options with cherries for #TwelveLoaves! Holly! 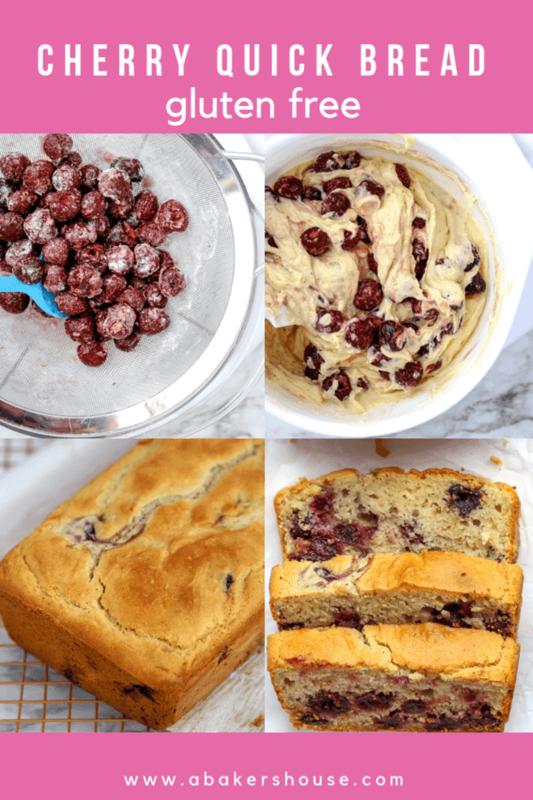 love love love this cherry quick bread! now that cherries are in season and are coming down lower in price, I’m getting a boatload more and am going to make this bread! love this! so pretty! Hi Alice, yes, I’d love to try this with fresh cherries too. A boatload of cherries sounds great! Quick breads are so versatile and I love that you made a delicious cherry one for our event. I think I would for sure have to cut down on the cardomom and am so intrigued by this combo. Thanks for baking with us, Holly! Cherries are my favorite fruit, Holly, so they definitely make me smile. I don’t know if it’s because they are such a rare treat or because they are just perfectly sweet and tart and juicy. Maybe both. Your quick bread looks wonderfully moist. I’d love a slice with my morning coffee right now! What kind of cherries did you use? I have only memories of Bing cherries. Ate em all Summer long. 🙂 This is a beautiful bread and love the addition of cardamon. I think I must make this one soon. I can imagine cardamom paired with cherries is a wonderful combination. 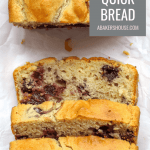 This quick bread looks delicious! I am a big fan of cardamom, but I am another who had not though of pairing it with cherries. 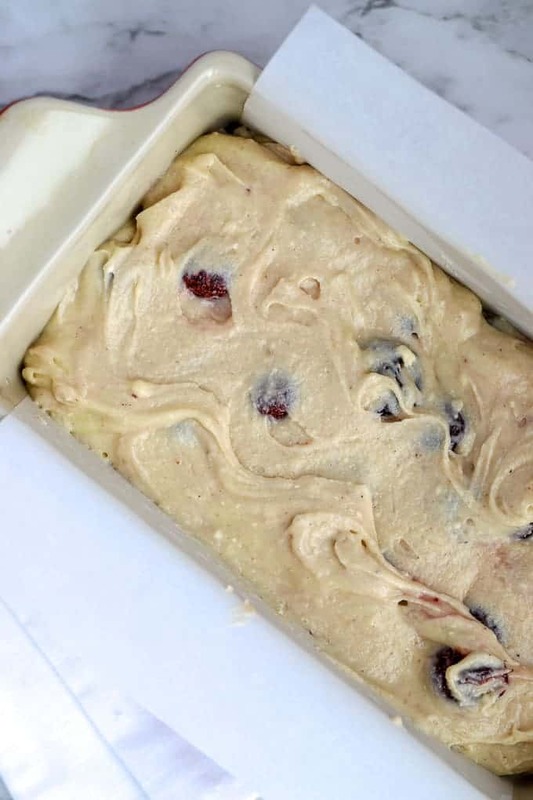 This quick bread has me thinking that I am going to need to keep fresh or frozen cherries on hand at all times so I can whip up a quick loaf. Quick breads and I get along very well. Always good and always rewarding. Thanks for the reminder that I need to keep frozen berries top of mind this time of year. Pinning this one, and will find time to make it soon. Thanks Holly. I love cherries. Usually I buy a big bucket each summer and freeze them for year round use. Unfortunately this year escaped me. However I still think I might have a bag tucked away! Hurray! This is just beautiful. All I have is Moreno cherries in a bottle. Would those work? Thanks, I’ve never baked with maraschino cherries. Is the type you mean in a jar with a liqueur? I’ve just done a quick google search and have found recipes with this type of cherry– cookies and cakes mostly. I believe there is a sweetener and other things added to those cherries that make them not the first choice for baking. If you do try it, let me know how it turns out. I love Cherry Quick Bread, I have version that I love to make, yours looks delicious! I also love the video you have on here, very helpful! Thanks, Sara! Quick breads are so easy to make, I think I’ll make some smaller versions to wrap as gifts this Christmas. This quick bread looks lovely! I especially like that you can make it with either fresh or frozen cherries.